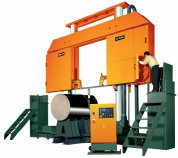 Cosen Saws are available in a wide range of cutting capacities and styles. From the Cosen manual - swivel head manually operated horizontal bandsaw to the Cosen automatic and semi - automatic horizontal band saws you are sure to find a Cosen Saw to fit your requirements. Cosen Saws are available in capacites ranging from 10" rounds up to a massive 78.7" rounds. Styles available range from the typical straight - cut type saw to the double miter - cut type saw. To find out more about America's Most Popular Metal Cutting Saw just give us a call with your requirements . Cosen Saws are America's Most Popular Metal Cutting Saws!